Cobblers boss Jimmy Floyd Hasselbaink has quickly drawn a line under the sending-off of midfielder John-Joe O’Toole for fighting at Sixfields on Tuesday night - and says the club will deal with the player ‘at the right time’. 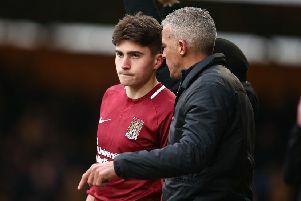 O’Toole was red-carded after 64 minutes of the 1-1 draw with Shrewsbury, being dismissed along with Shrews skipper Abu Ogogo after the pair were involved in a tussle in the Cobblers penalty area. He will be a big miss, and following the match, Shrews boss Paul Hurst pointed the finger at O’Toole for being the instigator of the incident. Hurst said: “I’ve had a look back from some wide angle footage and it’s hard to see exactly what happens. Hasselbaink said he isn’t convinced that is the case, but that regardles of that he wants to now just concentre on Saturday’s Sky Bet League One trip to Fleetwood. Asked about what he thought of Hurst’s comments, the Town boss said: “Well, both players end up on the floor. “But I don’t really want to talk about it too much, it has happened, it’s gone, and we need to prepare for the next match. Hasselbaink has yet to discuss the incident in detail with O’Toole, and says he won’t be doing so until the time is right. “I have not spoken in depth with John-Joe yet, and what we know is that he is going to be out for three matches, as will the Shrewsbury player. Speaking ahead of training at Moulton College on Thursday morning, Hasselbaink said there are no fresh injury concerns for the Cobblers, but he knows he will be travelling to the north west coast without the suspended O’Toole, as well as Matt Crooks who will serve the third of his three-match ban this weekend. “It leaves a space for somebody else to fill,” said the Town boss.